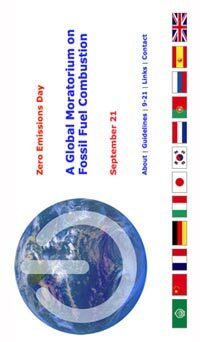 On March 21, 2008, a Website calling for a "A Global Moratorium on Fossil Fuel Combustion on September 21" was launched from Sealevel in Halifax, Nova Scotia. 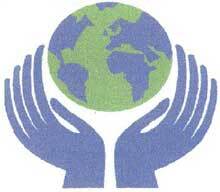 The message, "Giving our planet one day off a year", was simple yet profound. For true global reach the moratorium call was translated into 12 languages with assistance from Han Vermeulen and Anett C. Oelschlaegel at the Max Planck Institute for Social Anthropology in Halle, Germany (Dutch, German, Russian), and Ramzi and Linda Kawar in Halifax (Arabic). The initial inspiration for this actually happened 20+ years earlier. One day Ken Wallace of Sealevel Special Projects, was strolling his new born daughter past a nasty idling truck parked – driverless – by the neighbourhood pizzeria. This truck in combination with the surrounding unrelenting traffic swirling by gave rise to a strange epiphany: "Stopping all this for a bit would be most excellent for our world altogether." How could one initiate such an event? In the 1980s Usenet was emerging as an early Internet discussion system and after a logistics meeting with friends, a carefully composed "message of great importance" was posted to Usenet through a computer at Dalhousie University. Not much came of it at the time, still the idea stuck and – with the emergence of Internet social networks in the new millennium – the notion of creating a global celebration that had potential for universal benefit seemed a real possibility. In North America we'd largely eliminated the "day of rest" inherited from centuries old tradition. The notion that stopping, resting, recharging and reflecting was no doubt a mechanism built into many world cultures and traditions. By 2008 it was no longer a question of simply appeasing the Gods however, it seemed that indeed all systems might now be in jeopardy if we failed to comply with this timeless wisdom. 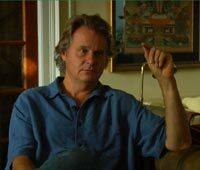 In March 2008, the Zero Emissions Day facebook group was created and rapidly was endorsed an impressive international circle including Canadian Anthropologist Wade Davis and more recently, American environmentalist, entrepreneur, journalist, author, Paul Hawken. In July we created an facebook event page for September 21. 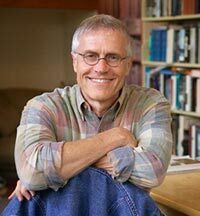 A year earlier, Bill Koeb, an artist living in Chapel Hill, North Carolina had registered the domain "zeroemissionsday" with much the same inspiration. 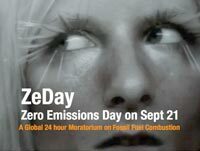 Through kind collaboration with Ken in Halifax, the global call to stop soon would be accessed online at zeroemissionsday.org. 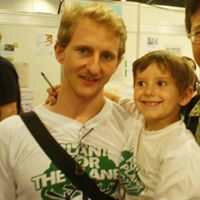 2008 had witnessed the establishment of a name (and an active Internet domain name), Zero Emissions Day, a focus on the cessation of burning fossil fuels, a date September 21st (fair to both North and South hemispheres and coinciding with the United Nations International Day of Peace), and four simple guidelines everyone could follow. The potential for a global and meaningful transcultural celebration had been created. 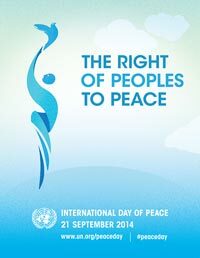 Coincidentally on September 21 Zero Emissions Day and the International Day of Peace when militaries worldwide power down, would immediately precede World Carfree Day on September 22, when everyone can party in the streets the world over. Subsequent to the United States presidential election, Ken wrote a letter to President Barack Obama on December 21, 2008, outlining the Zero Emissions Day meme and recommending his office participate. Several positive form letters from info@change.gov were received in return (In retrospect it became clear that the president was preoccupied – flying, driving and running a country and a military not necessarily in that order – on September 21, 2009). The true test for what people were starting to call "ZeDay" came when one actually tried to follow the guidelines for 24 hours. Everyone noted that the tendency to automatically turn things on – or jump in the car and start it – was rather hard to shake. On the other hand, many reported that the experience of going a day without using fossil fuel energy was profoundly transformative. What a great idea. Much like the annual Buy Nothing Day, or the more commercial, and if you ask me rather pointless, Earth Hour, this is a simple call for collective action to take some of the pressure off our dying world. It's important because it shows us what a day without fossil fuel use can feel like, and it's not that bad. In August ZeDay was defined in the Urban Dictionary. In January 2010, ZeDay.org was registered (to coexist with the longer domain name). The website was dramtically simplified to one page. The language translations, though well intentioned had become unwieldy. The Google Translation service had grown to almost 60 languages, and while not perfect was indeed very practical. The Web 2.0 app was overbuilt and undersubscribed so would be temporarily abandoned. The first annual Zero Emissions Day theme was introduced: "Buddy Up" – share ZeDay with a friend or friends. All subsequent themes would build on this. While observing ZeDay can be deeply personal, getting together with others and going "cold turkey" together can be not only fun but magic as well it was found out. The ROSE (RECYCLING OIL SAVES THE ENVIRONMENT) REPORT (PDF) from the Rose Foundation in South Africa featured Zero Emissions Day in a list of 2010 Environmental Dates. In June, Zero Emissions Day is featured and linked to in the London School of Economics Green News. In August 2010, ZeDay was presented at PechaKucha 5 in Halifax. 21st September is Zero Emissions Day, so forget your vehicles for a day, fix that puncture on your rusted ole bicycle and take it for a spin. "We are Generation Zero – the generation that achieves the transformation to a zero carbon world society!" Around this time Recyclebank featured a great write up on Zero Emissions Day in their Eco Library. In the spring Zero Emissions Day was included in events listings Scottish Power's Green Issue 10 (PDF). In August 2011, Zero Emission NEPAL formed on facebook based on the ZeDay model and inspired by the harsh realities of global warming in the Himalaya region. 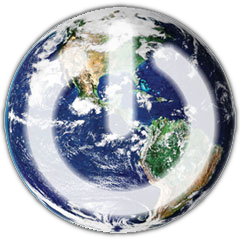 In 2012, the Zero Emissions Day theme was "Reboot" – Shut down everything non-essential powered by fossil fuels for a day – press reset — and then start up fresh. That year Zero Emissions Day was featured all over the World Wide Web including: sites associated with North American Association of Environmental Educators; Otsego County (New York State) Conservation Association; Hawai'i Environmental Education Alliance; Wiser China; Wiser Bangladesh; Learning for Sustainability, Yarra Ranges Shire Council, Australia; Kuwaiti Team For Global Warming; Eco Lifestyle International, Kuala Lumpur, Malaysia; Tenikwa Wildlife Awareness Centre, South Africa, Environmental Calendar; Zeday Indonesia on Twitter; Green Brunei, Borneo; Infrastrutture Group, Milan, Italy, EarthCare Sudbury, Ontario, Canada; Shashwat Prayas (everlasting efforts), India; September is a good month to celebrate the environment by Deborah Klughers, Long Island, New York; Give Mother Earth a break on Zero Emissions Day by Gerry le Roux in New Zealand; Newcastle University, Austrialia; ECOS Magazine from Austrialia; Voluntary Nature Conservancy, Gujarat, India; African Conservation Trust, South Africa; Association of Zoos and Aquariums (AZA) Toolkit for Increasing AZA-Accredited Zoo & Aquarium Contributions to Field Conservation, Enviance in Carlsbad, California. All this activity may or may not have been a result of a result of a Google Adwords campaign financed by a coupon. 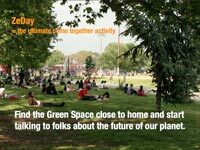 In 2013 the theme was “Potluck your Park” – a most excellent idea to nuture fossil-free communities. In September 2013 Becky Wink posted a great article entitled Zero Emissions Day: What it is and Why We Need it in the Ocean Thermal Energy Corporation Blog. Also in 2013, a paper was published by Ilan Levy entitled A national day with near zero emissions and its effect on primary and secondary pollutants studying the effects of a one day cessation of anthropogenic emissions during the Jewish holiday of Day of Atonement (DA) in Israel. This may be the only study which points to the ultimate impact a Zero Emissions Day might have on pollutants. It does not discuss the psychological benefits of clearing the air and yet these maybe implied. All in all Zero Emissions Day invites the conversation: Is this possible? What are we doing with our world? 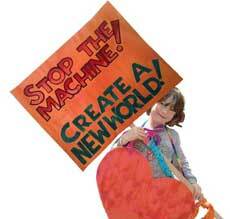 What do we really want for our world? We can see now that folks are not just adding September 21 to their calendars, but actually grappling with big questions. This is a good thing. In 2014, there's a major action on climate change scheduled for September 21st, first from Bill McKibbon's A Call to Arms: An Invitation to Demand Action on Climate Change in Rolling Stone manifesting the People's Climate March. 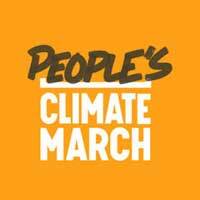 And then from the Avaaz call for The Global People's Climate March. These events really only make sense if they can happen without fossil fuels – otherwise they aggravate the very issue they are attempting to alleviate. Everyone knows this. We're finding that more and more people, families and communities are declaring Zero Emissions Days whenever they please and just for the fun of it. People who have had the experience have been transformed deeply by it. In the end, it's not about massive public relations and media campaigns that are here today and gone tomorrow. It's all about individual awareness, mindfulness and the choices we make. It's about realizing yes we can all stop harming ourselves and our planet – if only for one day. We can do this. We can all do this. Kudos to: Boston Green Schools; EcoJIS: Jerudong International School's Environmental Committee; Environmental English; Greater Sudbury, Ontario; Hergo Sun Japan aka: Infrastrutture SpA, Milano; Jacob's Creations; News With Chai; Pinterest; Popular Resistance; UNDP Global Environment Facility SPG Nigeria Newsletter Vol 3, No 1; USagain; Water Is Life Blog – Jan Moore; Wikipedia List of environmental dates; and World Heritage Encyclopedia, for featuring Zero Emissions Day in 2014. Also in 2014 California Solar Systems created a Zero Emission Day Check list to coincide with their "Clean Up the World Weekend." In 2015, Mechanical Engineers at Carnegie Mellon declared Zero Emissions Day Can Be Every Day. 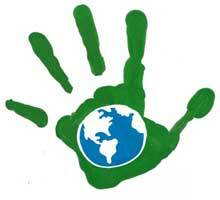 Michelle Honeyager wrote a great piece for Recycle Nation It's Zero Emissions Day! How Can You Shrink Your Footprint? Michael Buchanan's piece on the Solar Decathlon for Share America went viral Zero Emissions Day? It’s every day at these houses. featuring state-of-the-art energy-efficient homes. In 2016, Jacopo Prisco, a London-based journalist for CNN International produced How I lived without emissions for a day, an amazing documentary including the hashtag #CNNZeDay. "I tried to go emission-free for 24 hours, avoiding any activity directly connected to fossil fuels. Here's what happened..."
And Gabriel Posternak wrote a compelling Zero Emissions Day – a 24-hour break for our planet on the California-based Treeium Home Improvements website. Chasing Coral - Original Motion Picture Soundtrack has been released exclusively for one week on iTunes and Apple Music on Zero Emissions Day, September 21st. Finnish IT company Tieto said on the occasion of Zero Emissions Day (21 September) that it is accelerating the use of sustainable energy at all its data centres throughout the Nordic region. In conjunction with Zero Emissions Day today, TC Euro Cars is offering a special promotion exclusively for three units of the full-electric Renault Zoe. Business executives reduce their emissions on a zero-emission day on 21 September. The Ethicalist: It’s Zero Emissions Day on September 21, so take a Tesla to work instead of your usual taxi now that Dubai has added 50 of them to the Emirates taxi fleet. Plan to give Zero Emissions Day your very best shot in 2018! Share with everyone you know. Every individual's effort on Zero Emissions Day is what counts!